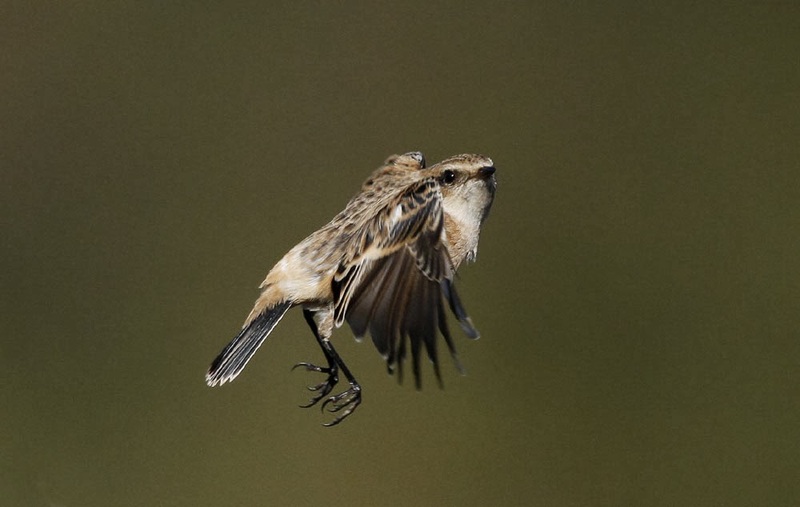 The Siberian Stonechat was still preforming well at Scalby Nab throughout the day. On the move (south unless stated) were 200 Pink-footed Geese, 2 Kittiwake north, 9 Auk sp + 24 north, 28 Wood Pigeon, 3 Skylark, 4 House Martin, 11 Meadow Pipit, 1 Rock Pipit, 1 Fieldfare in and south, 3 Starling in and west, 8 Chaffinch, 18 Goldfinch, 32 Linnet, 1 Redpoll sp, 1 Reed Bunting. A Spotted Redshank flew east over Taylor Way and brings the yearlist to 230! Elsewhere 2 Barnacle and 3 Pink-footed Geese were on Burton Riggs, 16 Teal were on Johnson's Marsh, 114 Wigeon were on Scalby Mills and 30 were on Flotmanby and on Wykeham South Lake were 4 Egyptian Geese, 36 Wigeon, 4 Pochard and a Little Stint.